The secret of being a successful landlord lies in giving the tenants what they want, need or expect. Believe it or not there is a big difference between being a landlord and being a property owner. Buying rental property is one thing and being a landlord who is able to retain tenants and keep the property rented is a completely different thing altogether. If you have rental property but you are unable to get it rented or tenants are constantly vacating your property then you cannot be termed as a successful landlord. Being a landlord is not easy; you need to constantly be on your toes regarding the maintenance and condition of your property. Furthermore, you are required to take every possible step to ensure renter’s satisfaction so that your property stays rented. In this regard, we can help you out. We have created a list of things that might help make your rental unit so attractive that renters would want to stay for as long as possible. Pay attention to the following aspects and try to embed as many points as possible in your property. If your unit boasts of adequate amount of interesting places that are within walking distances, then you can expect tenants to love it. Walking distances are among the first things that every renter notices even before inspecting the property from the inside. No matter how luxurious the property is, the location relation to restaurants, shops, parks, school and entertainment/recreation points remain the main attraction to renters. You must ensure that your unit scores high on this point. Usually families prefer property that is closely connected to the city center or locations they need to access on a daily basis such as school or office and grocery stores. People want to be able to walk anywhere so if your property scores somewhere between 50 and 100 on Walk Score then you can feel relaxed as this means your property is within walking distance of most amenities while a score between 0 and 50 means that the unit is car dependent. Typically, renters never worry about the maintenance of the property but the landlord has to remain alert at all times. It is usually the responsibility of the landlord to perform necessary repairs and keep the property in top conditions. Therefore, before renting out your property, we suggest that you make sure there aren’t any maintenance related issues. Even when the property gets rented and tenants have moved in, you need to carry out regular inspections to ensure that the unit is well maintained. Be responsive to major to minor damages and perform the repair as soon as possible. Off-street parking is every renter’s dream and people who own a vehicle (who doesn’t own one nowadays?) look for rental units offering a parking place. So, if you don’t have this feature in your unit, try to make room for it and advertise about it as much as you can. Remember that in most urban areas a parking spot is a rarity so if your unit has the space, flaunt it and you will see renters pouring in immediately. If you cannot create garage space on your property then look for any off-street parking spot like a sheltered area or a driveway and offer it to your tenants as the parking place. Usually renters have no issue with street parking in the suburbs so go for it. You can easily impress potential renters by creating ample storage space in your property. Walk-in closets are quite popular among renters so you might want to build one if your property doesn’t offer walk-in closets. Try to create storage spaces at areas that otherwise would be left useless such as the balcony or space under the stairways and the bedrooms must feature large cabinets and closets. Renters prefer properties that come with washer/dryer. You might think of it as an additional expenditure but in reality it makes the unit a lot more desirable to prospective tenants. It is also possible that the renter already own washer/dryer or are willing to buy one, so in such as case we suggest that you at least built a separate laundry area where they could place and install the washer/dryer. It turns out to be the ultimate game changer if your property is located in a hot and humid area or the climate overall remains hot. Installing an air conditioner is not enough to make the property attractive to tenants; what we mean is that your property must be airy and offer central-air conditioning system. Do not install window ACs because these prove to be a nuisance in humid weather as they add more moisture to the air. Related: Should Landlords Allow Tenants with Pets? If you can allow pets, your property will become most desirable among tenants. Most families own a pet or more than one so offering a pet-friendly property or having flexible pet policies is very beneficial for the landlord. Renters require security assurance so you need to make your property fully safe and secure for them. By safety we don’t mean that you need to install highly advanced locks to the doors but that you need to make the property secure. Install indoor alarm systems, surveillance cameras, adequate outdoor lighting, windows with grills, deadbolt locks to the doors and add wooden dowel to the bottom side of the sliding glass doors (if any). This would make tenants feel safe on your property and want to stay there on a long-term basis. Amenities like fenced-in yard, balcony, deck, patio and a small pool are all desirable to tenants. Actually, renters nowadays look for outdoor areas in a property as they get to unwind and relax and outdoor spaces let them do just that. They are able to enjoy the weather and spend quality family time so why not give them this exclusive amenity in your unit? Last but not the least if your property is considered “smart” then the millennials would love to rent it immediately. Adding Internet of Things devices, automated temperature controls, solar lights, energy efficient appliances and wireless internet are all important elements of our everyday life now. So, making the unit tech-savvy and ensuring comprehensive connectivity between devices will definitely be the deciding factor for many tenants. 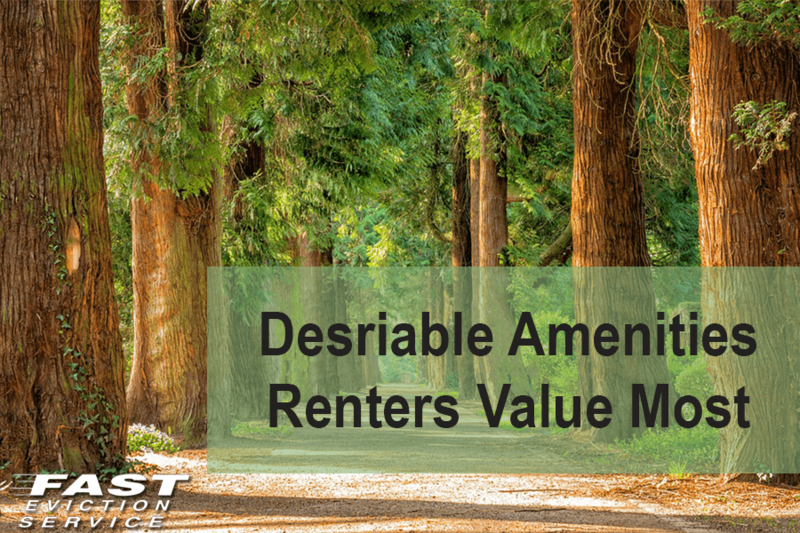 These are a few of the amenities renters value most that can have an important impact on attracting the best tenants and keeping them happy staying on your property a long time.